Are you puzzled to understand how to delete an object from a photo? It is one of the most common problems that we have encountered in our technological journey and dozens of users continue to complain of difficulties in completing this operation. Fortunately, now the web is full of tools that greatly simplify the use of the PC and we can safely say that, after trying Jihosoft Photo Eraser, this software enters right among our favorites. Its operation is really simple and we will explain it in detail in the next paragraphs. 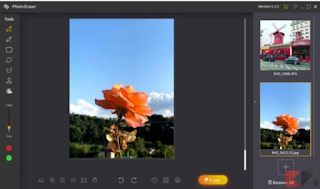 In the meantime, we can say that, if you are looking for software to delete objects from photos, today we will present a really interesting one. Jihosoft Photo Eraser is available for download via the official website in both free and paid versions. In fact, just click on the "Free Trial" button to download the program and you can easily install it on your Windows PC or MacOS. As always, before buying the full version, which you find here at $ 39.95 with license without time limits, we suggest you try the free version. In this way you will be able to test with your own hand if the capabilities of the software match your personal needs. From the beginning we want to clarify that the graphical interface, currently available only in English, is really well done and easy to use. All the commands are in fact very intuitive and you will find, after our review, that everything you thought was difficult to achieve, suddenly becomes very easy. During your holidays you have taken a particularly interesting photo but you have not managed to get rid of the tourists who were passing by? This is no longer a problem today, thanks to the fantastic Jihosoft Photo Eraser software. 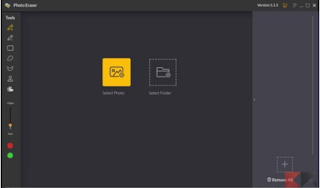 If your intent is to delete an object from an image in fact, after you have downloaded and installed the program you will be able to do it in a few minutes. The first thing to do once you start Jihosoft Photo Eraser is to press the button highlighted in yellow with the words "Select Photo". From here, thanks to the navigation tool integrated into the operating system, you can choose one of the images you have saved on your PC. In our case, for example, we decided to try to eliminate a rose and leave only the background with the landscape. Without any specific knowledge it would be really difficult to complete the operation and for this reason we are curious to find out how Jihosoft Photo Eraser will manage it. First you have to choose the tool for selecting the contours, the first one on the top left depicted by a pencil with a + next to it. If the size of the brush is too large, you can modify it by scrolling the appropriate bar positioned on the left. Once you do this, proceed to select the contours of the object you want to remove. In our case, as you can see from the next image, we have selected the contours of the rose in a manner that is not exactly precise. Once you are sure that you have correctly highlighted the objects to be removed from the photo, you just have to click on "Erase", which you will find on the right highlighted in yellow. We must admit that, in this case, we were pleasantly impressed by the results obtained. We must also add, however, that we have encountered some difficulties when, in the background to bring out, there are more combinations of colors and complicated plots. In most cases, however, Jihosoft Photo Eraser does its job very well. We almost forgot: to save the photo then just click on the appropriate button on the left of "Erase". Here is the real difference between the free version and the paid version. 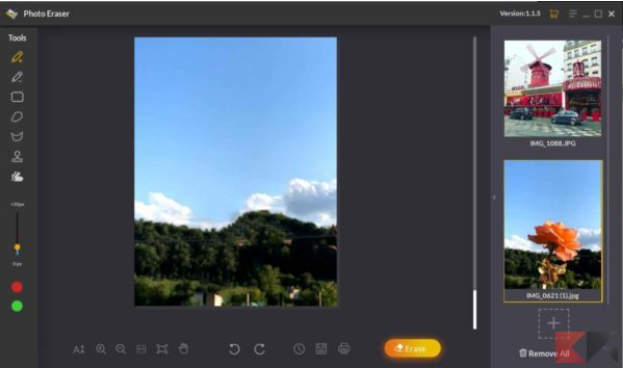 With Trial Mode in fact, in the picture will be integrated a watermark, which will be possible to remove only with the purchase of the full version. As you understood from this review, we can be satisfied with the operation of Jihosoft Photo Eraser, very useful even in free mode. Of course, it does not integrate advanced features like other programs designed specifically for graphics but still manages to be simple and effective. We remind you, if you missed it among the lines of the article, that Jihosoft Photo Eraser is available in two versions, a free version to test functionality and a paid one with a single cost of $ 39.95. You can download both versions from this link. Gihosoft Photo Eraser Erase unwanted objects and perfect your amazing photos! For those of you who are really passionate about photography then, we leave you some dedicated guides that we are sure you will appreciate.